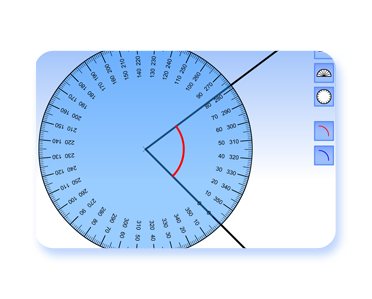 An interactive whiteboard resource to demonstrate the measuring of angles to a class. The two black lines can be moved to create varying angles. The arcs signifying the angles in question can be toggled on or off leaving one or both on display by using the two buttons with the red and blue arcs in them. There are two type of angle measurer that can be used: a 180 degree protractor and a 360 degree angle measurer. These can be toggled by the appropriate buttons on the display or removed by using the very top button. The angle measurers can be rotated by clicking and dragging. They will always be centred over the point where the lines meet. Using this resource you should be able to realistically demonstrate the measuring of angles. Please report any problems or suggestions in the comments section. Amazingly simply yet effective – well done and thank you. I intend to use this in my Ofsted lessons next week. Thanks and good luck with Ofsted. How easy is this…can be used just with a data projector. So much easier than trying to show the kids what’s happening with the protractor. Thanks so much. is the only way to get to this activity through this website, or is there a direct route? The resources can only be used on line. If you bookmark the All IWB Resources page you are only a couple of clicks away from each resource.